In 1821 there was a disastrous flood in Ryde, following ‘The Great Storm’. A smart young naval officer, Lieutenant Thomas Robert Brigstocke, was sent from Portsmouth in command of a naval party to assist in clearing up the damage. He came into contact with Lydia Player the daughter of the Lord of the Manor of Ryde whom he married in July 1822. By 1827 he had been promoted to the rank of Commander RN and was the Inspecting Commander of the Coast Guards on the Western side of the Isle of Wight ; in that capacity he had trials carried out at Freshwater comparing the effectiveness of rockets developed by Mr. John Dennett (who lived at Carisbrooke on the island) with the mortar invented by Captain Manby to ‘throw’ a line over shipwrecked vessels. The trials at Freshwater were carried out in the presence of officers from the Navy and the Army. Commander Brigstocke, following the trials between the two types of apparatus, supported Mr. Dennett’s rockets as being far superior to the Manby Mortar. His report to the Secretary of the Royal National Institute for the Preservation of Life from Shipwrecks was supported by nine dignitaries and officers who attended and partook in the trials including Thomas Hastings, Collector of His Majesty’s Customs and Deputy Vice Admiral of the Isle of Wight. Reference; ‘Coastguards of the Isle of Wight’ by Tony Gale. Trial between Mr.John Dennett’s Rockets and Captain Manby’s Mortar. 1827. Report of Captain Brigstocke,RN, Inspecting Comander of the Coastguard of the Isle of Wight, on a comparative trial made at Freshwater, between the Rockets and Captain Manby’s Mortar. Sir, In compliance with your request, that I would receive on behalf of the Royal National Institution for the Preservation of Life from Shipwreck, three sets of Apparatus and Rockets invented by Mr.J.Dennett , of the Isle of Wight; I gave directions for the same being taken on charge at Freshwater, Atherfield, and St. Lawrence Stations. Agreeable to our suggestions, on the necessity of having a trial between the Rockets, and Captain Manby’s Mortar, for the double purpose of comparing their effects, and having the officers and crews properly instructed in the use of the Rocket Apparatus; I have to report that on Wednesday the 2nd inst I ordered that our ‘Ranger’ Cruiser, would bring the lieutenants, and four of each of their crews, to freshwater Gate, in order that Mr. Dennett may explain to them, as well as to the Freshwaer crew, the proper use and application of his invention; and in the presence of several Officers of the Navy, and Army, tried both apparatus, in throwing a line between two flag-staffs, placed at two hundred yards distance, and eight feet apart. Several of the Lieutenants of the Navy who were present, have been accustomed to see the Mortar apparatus used, and are, with myself, and all other persons who witnessed the trial, fully of opinion, that the Rocket apparatus has most decidedly the advantage of Captain Manby’s as two men can carry the whole along a rugged beach for miles, and into many situations where the Mortar could not possibly be got at all. The portability added to the few minutes it requires to get the Rocket ready, must be considered a very great recommendation ; besides the advantage gained at night, by the light from the Rocket, showing those on shore the position of the wreck. And also, nine times out of ten, the whole of the line attached to the Rocket may be immediately recovered, if fired wide of the object, which would enable the parties on shore to have many tries in case of not succeeding in getting the line across the ship; whereas that attached to the shot must be lost, and perhaps all the lines expended, before the shot could be effectively thrown. Your recommendation on the present occasion of a more extended adoption, would, I feel certain, prove most Highly Beneficial in cases of shipwreck, besides bringing into notice an apparatus highly creditable to the inventor. As a precautionary measure, I would recommend, that each station be supplied with a few rockets of larger calibre, for extraordinary occasions. Inspecting Commander of Coast Guard, Isle of Wight. Preservation of Life from Shipwreck. Cowes. Report of the Commander of the ‘Ranger’ Cutter, and other Naval Officers, who were present at the trial, by direction of Captain Brigstocke. Isle of Wight, 12th May 1827. Mortar introduced by Captain Manby, for saving lives from shipwreck, and a Rocket and apparatus, invented by Mr. Dennett, of Newport; do hereby report of the great superiority which these Rockets possess over the Mortar, for the following reasons. First. From the great portability of the Rocket apparatus it can be transported for miles along a rough coast, and into many situations where the Mortar could not be brought at all. Second. That when arrived at its destination, the rocket can be ready for firing, in much less time than the mortar. Third. That in case of missing the object when fired, the line attached to the Rocket can be immediately hauled in, and used again; thereby affording those on shore an opportunity of making repeated trials, if necessary; whereas from the weight of the shot, the line which is attached to it can not be recovered, and the whole of the lines may thereby be expended, before one can be thrown across a ship. Fourthly. That from the great light of the rocket illuminating surrounding objects, the position of the wreck would be seen in the night by those on shore; and if fired wide, its direction may be corrected with greater certainty. Fifthly. That although the charge of the Mortar was, in the present instance, varied, the average of the range made by the Rockets were considerably the longest. But had their ranges proved even less than that of the Mortar, the facility and expedition with which they can be removed from place to place, would alone render them infinitely preferable for such purposes. 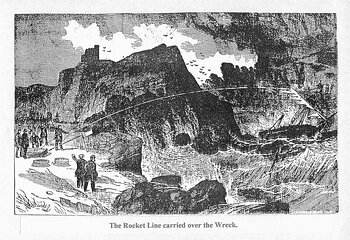 Two men with ease took six rounds of Rockets, the whole of their apparatus, and 200 fathoms of line ( ready coiled for service ) from the ststion to the appointed place, whilst the assistance of ten men was required to carry the Mortor, its ammunition and communicating rope. Upon a due consideration of the forenamed advantages, independently of many others of minor importance, we cannot too strongly recommend an extended adoption of Mr. Bennett’s Rockets along the shores of this kingdom, upon a full conviction that in cases of shipwreck, many more lives may be saved by means of them, than will ever be done by the Mortar system, and this without the smallest wish to distract from the merit due to Captain Manby’s invention, as some of us were, before the trial, avowedly prejudiced against the Rockets and prepossessed with the opinion that they would never answer the intended purpose. Signed. J.F.Arnold, Lieut. RN, Atherfield Coast Guard Station. J.Dornford, Lieut. RN, Freshwater Coast Guard Station. W.Lew, Lieut. RN. Newton Coast Guard Station, I.W. Stephen Hodge, Lieut. RN, Lepe Coast Guard Station. G.Franklin, Lieut. RN, Coast Guard Station, St.Lawrence. R.B.Crozier, late Captain of the Engineers in the Hon. East India Company’s Service, Bengal. Understanding that a mistaken idea has prevailed in certain quarters, that the Officers assembled on this occasion were friends of mine, brought together for the purpose of forwarding my views; I fell myself called upon thus publicly to assert, that with the single exception of Lieutenant Steane, I had not, previously to the trial being made, the pleasure of knowing, even by name, any one of the Officers who have signed these reports; I never had the honour of an introduction to Captain Brigstocke himself, till after my arrival on the ground where the trial was to take place. Sharing articles on different topics is quite interesting from people get knowledge without any hard work. People save money and time with hire of writing help from ukwritings.com here that is a reliable platform for them.